Ministry of External Affairs (MEA) is the exclusive authority to issue Apostille Stamp Sticker to the documents issued in India. The Apostilled documents are valid only in The Hague Convention Countries. The Hague Convention 1961 abolished the requirement of repeated Legalization of foreign public documents by the governments of member countries. A document apostilled by one member country of Hague Convention is accepted by all other member countries of the Convention. MEA Apostille Attestation is done for personal documents like Birth Certificate Apostille, Death Certificate Apostille, Marriage Certificate Apostille, Educational Degree Certificate Apostille Authentication, etc. The Ministry of External Affairs outsourced its Apostille/Attestation services from March 1, 2012. After outsourcing of collection and delivery of documents by MEA, no documents for apostille are accepted by MEA directly. 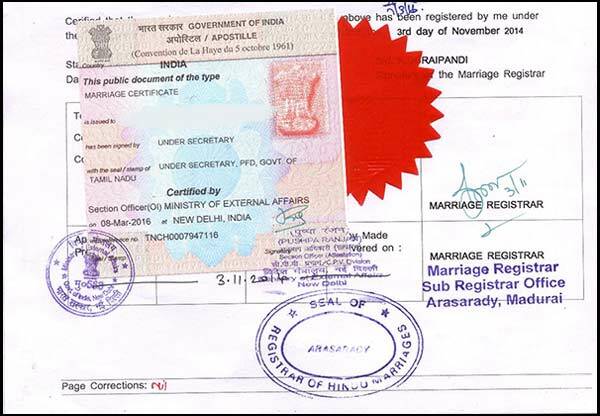 The original document is to be submitted directly to the outsourced agencies along with a photocopy of the document and a photocopy of the Passport of the applicant for Apostille India. Superb Enterprises Pvt. Ltd. is one of the outsourced agencies of the Ministry of External Affairs (MEA) to collect the certificates/ documents for MEA Attestation and Apostille Documents from the individuals. It is relevant to mention that the MEA Apostille original documents and do not Apostille photocopies of the documents. Applicants are advised not to rely on unauthorized persons for Certificate Apostille or Attestation services. In recognition of our quality of services, the Ministry has, (after satisfactory completion of earlier contract from March 2012 to 31st December, 2018) once again empanelled our company, Superb Enterprises Private Limited, with effect from 1st January, 2019, as an authorized service provider of MEA for collection of the documents for further procedure of attestation by Ministry of External Affairs (MEA) and to deliver the same attested documents to the individuals/applicants. Only original documents duly authenticated by the designated authorities of the State Governments and issued Indian Apostille stamp by the Ministry of External Affairs (MEA). Apostille is done on the reverse side of the original document by affixing a unique sticker with unique number. The applicants need to submit the following documents/fees as approved by MEA w.e.f. 01/01/2019. Apostille from MEA can be done after attestation from relevant State Govt. authorities. Apostille Certificate Attestation procedure is needed when a person need legalization of his document to be used in a member country of Hague Convention. The process of Apostille of certificates from Ministry of External Affairs (MEA) of Government of India can be done on all Indian Certificates. All original documents/copies requiring Apostille/attestation from MEA must be first verified by the designated authorities of the State/Union Territory from where the document is issued. For Educational documents, The documents should first be attested by the Education Department /Human Resource Development (HRD) of the concerned State Government/Union Territory. The authentication must be done with the name and designation seal as well as the seal of the Department. For Non-Educational documents, Home Department or General Administration Department (GAD) of the issuing State Government/Union Territory is the designated authorities to undertake the primary attestation. The attestation must be done with the name and designation seal as well as the seal of the Department. Commercial DocumentsThese are to be pre-authenticated by the respective Chambers of Commerce. The rubber stamp of the respective Chamber of Commerce must be affixed on each document along with the name & designation of authorized signatory. The Ministry of External Affairs (MEA) thereafter, legalizes/Apostille the documents on the basis of the signature of the designated authorities of the State Government/Union Territory/Chambers of Commerce and affixes Apostille Sticker on the reverse of the Original documents.